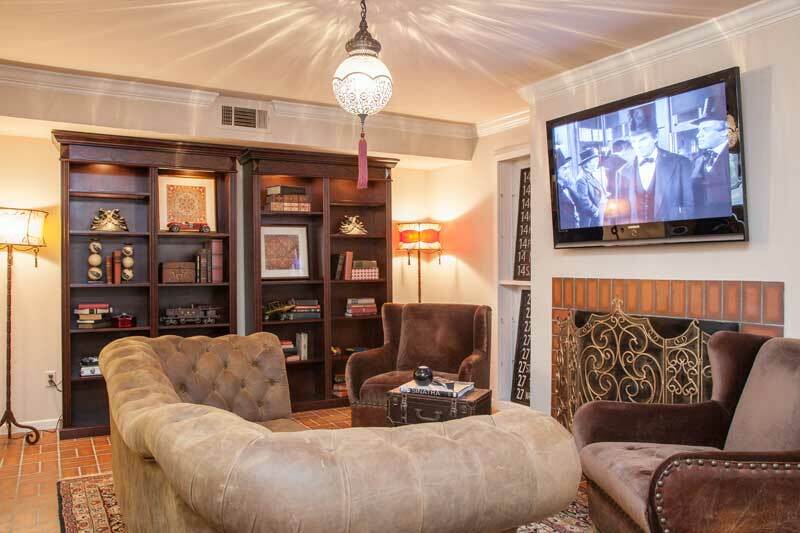 The Speakeasy Suite is more than just a place to stay, it is an experience. From the moment you walk in the door, you know you have arrived at a special place, full of surprises, and located in the heart of the action. Set amongst courtyards with fountains in central downtown, this premiere suite provides more space and luxury than local hotels. 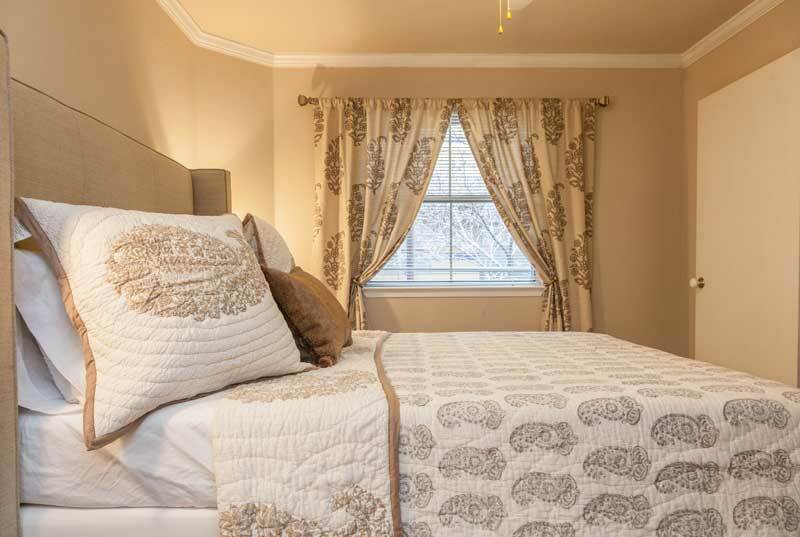 With 2 enclosed bedrooms, 2 full bathrooms, a large kitchen, living room, private parking, and arguably one of the best locations in the city, there are so many reasons to call this place home during your trip to Austin or downtown staycation. The Speakeasy is directly across the street from the Austin Convention Center, making this an ideal location for anybody attending a conference. In addition, the Speakeasy is just two blocks from the world famous 6th Street, the Warehouse District, Rainey Street, and a short walk from every other downtown attraction. If you drink coffee, Starbucks is just across the street. If you practice yoga, check out Wanderlust, which is also across the street. The Town Lake hike and bike trail is minutes away. The apartment was clean and well appointed. I was impressed by the lock system that allowed for keyless entry. We had 4 people and while there are air mattresses we found it easier to just double up on the beds. Ryan was easy to reach via phone and text about any concerns we had. The location is perfect, we were able to walk or take short cab rides everywhere we wanted to go. It was a great trip and I’d definitely stay here again! Thanks Ryan! We enjoyed our stay at this very conveniently located condo. Four of us were there, two in each bedroom. Nice to each have our own bathrooms. At first we thought it would be difficult without a kitchen table, and four people with only two stools at the counter. (How would we balance our sandwiches and chips on our laps on a sofa? And then breakfast?) But it all worked out fine! The towels were not only plentiful, but plush. The “speakeasy” décor was fun. The keyless entry was convenient. The location is perfect. Right next to the convention center and just far enough away from 6th street (2 short blocks) to be nice and quiet all night. What a great place! Was great that we were checked on via email / text to see if we arrived okay or needed anything. Ryan was very attentive as a host and his place was perfect. Especially for events at the convention center or doing anything in Downtown. Can walk anywhere. Apartment was great and exactly as listed. This was the perfect base of operations for a great weekend of Austin activities. 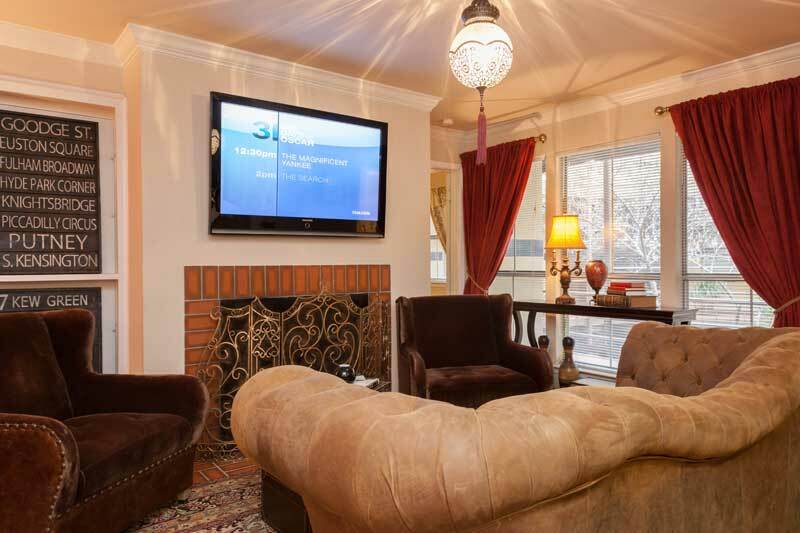 So close to the heart of 6th st, and a short walk from many of the cities other attractions. The included parking space is secure and a nice value added perk. The Speakeasy was perfect for me & my 3 other guests. The amenities & location were perfect for us. We walked to many sites & restaurants. Ryan was available whenever I had a question or concern about our trip. I would highly recommend this place to stay at! My coworker and I stayed here during a conference, and were very pleased with our experience. The location is as convenient as you can get to the convention centre, and the apartment itself is well-equipped. The two bedrooms are spaced far enough apart that they allow for some privacy. Ryan was a very responsive host, and provided us with ample information about the unit and local attractions in advance of our stay. I fell completely in love with Austin, and would be happy to stay at this property again! Listing for the property is completely accurate. Condo was nice and neat. Perfect for our one night stay in Austin. The overall complex is slightly noisy due to location near 6th street and many large groups on a Saturday night. We were out as well so did not bother us. We had a great time and enjoyed our stay. Thank you Ryan! Ryan, our host, was very detailed and accurate in his description of the property. The property, location and comfort of this property exceeded all our expectations. Ryan’s even included tourist information in our information package that made our trip even more enjoyable. My friends and I were in town for a wedding and couldn’t have stayed at a more central place. We arrived in Austin earlier than check-in and Ryan mentioned we could leave our luggage in their storage area until our unit was ready (as another party had checked out earlier that morning) to our surprise, the unit was ready upon arrival (about 12pm). Unit was clean and had plenty of room. I would definitely stay here again if back in Austin! The Speakeasy was as described and pictured, very clean and well decorated. We felt right at home and the beds were comfy! This is such a great location and a much better value than staying at a hotel. If you want to experience downtown Austin in comfort and style, this is the place to do it!! The apartment was exactly how it was listed in the description. I was attending a conference at the convention center and this apartment is located directly across the street, so that made it really convenient. Also, the mattress was super comfortable, which is always a plus! A group of girlfriends and I stayed at Ryan’s Airbnb for Memorial Day weekend. We had a great time (despite the tornado warnings and floods!). It’s easy to get in and out of the apartment complex with the key pads – makes it nice to not have to share keys with a group of six. The location was also great – we had an easy time walking to places of taking a short uber ride. We loved Austin and would definitely stay here again. Great condo in a quiet condo complex located within walking distance to anywhere downtown. Cabs are almost always parked across the street if, like us, you don’t have a car. The hosts were responsive and very pleasant. Would highly recommend. What a great spot in downtown Austin. We were in town for a wedding and this house was right in the heart of all the fun! Walking distance to downtown and to South Congress. The house was very comfortable and our hosts were very accommodating. Location, location, location. What a great place. We came to Austin for a trade show. The condo is located immediately across the street from the convention center. It could not have been more convenient for us. This was our first time using Airbnb and definitely won’t be our last. We were greeted at the door by Thomas, one of the property managers. He offered to show us around and take care of any of our needs. The condo was very functional for us, super clean, relaxing and a great place to have business meetings as well. When we come back to Austin, we will absolutely be staying here. Ryan’s speakeasy was as advertised in an excellent location central to downtown Austin. It was a good size for our group of four and checking-in and out couldn’t have been easier. The complex itself had a great vibe with a really cool courtyard pool. Ryan was gracious enough to accept our group for a last minute, spontaneous 4th of July trip to Austin and was quick to address all our questions and respond to e-mails. All-in-all, we enjoyed our stay and would stay here again. 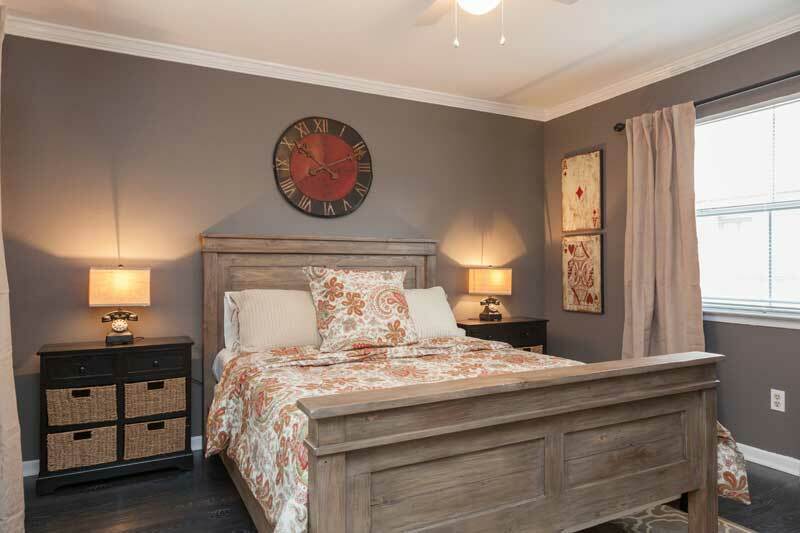 Great location – Central to everything in Downtown Austin. Had an issue using access code, called and the issue was immediately addressed while on the phone. Very simple and great response! 5 stars. The condo is in a fantastic location. Easily walkable to many different areas and directly across the street from a taxi stand. The inside of the condo itself was spotless and super comfortable. The only downside is that even with the windows closed, it is a pretty loud neighborhood (a white noise app on your phone helps!). We would definitely stay here again. I had to extend a work trip last minute by an extra day. Ryan and Thomas both helped me out and moved me to another unit in the same complex. I was so impressed with the responsiveness and willingness to help me. Also, it was honestly easier than checking into a hotel. You get all of the info for gate codes and door codes when they approve your request. Overall great experience and can’t wait to stay here the next time I’m back in Austin! We stayed here over New Years Eve and everything worked out great. They were able to accommodate us checking in early, which was a huge plus! Very good location to walk anywhere downtown. Location was amazing! Two minute walk to sixth street. Six minute walk to Rainey Street. We used rideaustin and Fasten (car services like Uber) to get to SOCO and to Broken Spoke. Use the promo codes for free or discounted rides! There was a CVS about 5 min walk. Also the most exquisite Whole Foods about 20 minute walk. Ate at some delicious restaurants all within 5 minutes from condo. (Eureka!, Stella San Jac, Cafe Blue). The condo was great and I would definitely stay again! I liked having the keypad entry so we didn’t have to worry about caring around keys. 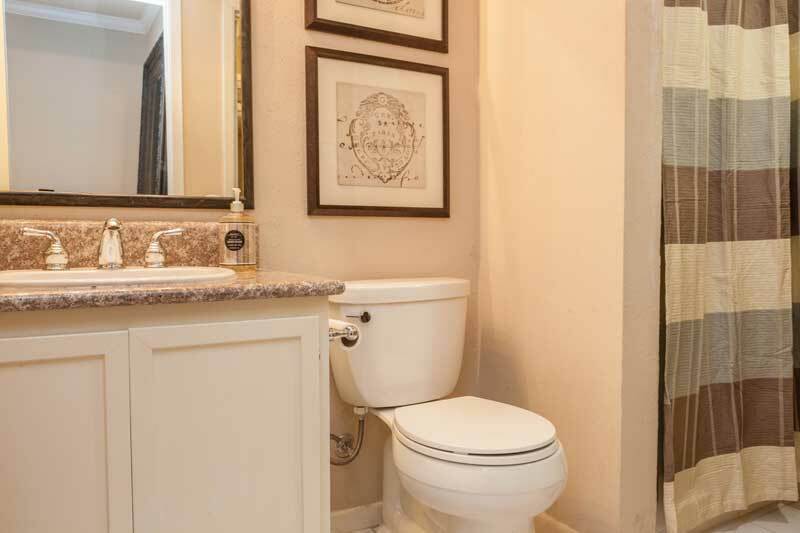 Right when you walk into the condo there’s a bathroom straightahead and one of the bedrooms to the left. To the right is the kitchen and living room. In the master bedroom is in the back with the master bathroom and walk in closet attached. There was a slight issue when we arrived because our code we were given in our welcome email did not work, but luckily some other travelers came up and gave us the right code. (I texted Thomas and they had changed the codes the week before it was updated on Airbnb). Also I I like to settle in when I am traveling, but there were only 3 hangers:( I got a hold of Thomas (very fast response) and he sent some over the next morning! I really appreciated all the great touches throughout the condo. They really did a great job with the decor! Made it feel more comfy! (Some Airbnb’s can feel so sterile). TVs in both bedrooms and living room. Plenty of paper towel, toilet paper, towels, pillows. Plenty of dishes and glasses. I will note that kitchen could use better cooking utensils (had metal for nonstick pans). Also could have used scissors. Also the condo always felt a little muggy. We had the air on, but didn’t seem to work that great. (I did not contact cause wasn’t a big deal as it cooled down our last two nights, but just mentioning it.) Bed comfiness rating would be maybe a 6. There were three entrances into the building and at different times some of them would not work, it was a little frustrating. Ryan and Thomas were so quick to respond to any questions (I’m talking minutes)! Great hosts! Great place! Would definitely recommend and would happily return! Ryan did a very good job of communicating and keeping in touch with me. He was quick to respond after I failed to read all the information in the email send to me. I recommend staying with him. Second floor unit with a great location. Clean and modern. Perfect for two couples sharing or a girls weekend. Modern with all amenities. Great central location! Comfy and clean! This review is for the Austin Downtown Speakeasy listing. The place looks exactly like the pictures, however a wide lens was used so the pictures makes it looks bigger than what it really is. Really nice place and fit 4 adults comfortably. The updated look with granite counter tops has a luxury feel. It is nicely decorated. My welcome letter went into my spam account therefore I didn’t have the room code, however Ryan was quick to help out and get us into the room. The beds were comfortable. I slept well with no outside noise waking me up and I am a pretty light sleeper. The sitting area with TV was a bit tight and we had to move furniture around in order to watch a movie on TV. The shower was a little lacking in pressure but got the job done. I liked that there was shampoo/conditioner, body wash, dish washing liquid, coffee, and other items already in the condo. It was nice being so close to 6th street and the convention center. The pool was a slight disappointment. It is very small. With 7 teenagers in the pool it seemed crowed and could not really move around well. No swimming could be done. It’s more like a place to stand and cool off for a few minutes. If swimming is a big part of your stay, I would not recommend. Parking in a gated/private parking lot was another bonus. Overall, I really liked this place and would stay again. Much better than a hotel in my opinion!!! We stayed five nights at the Railroad apartment. It was perfect! The location can’t be beat (right downtown and only blocks away from 6th). Ryan provided easy check-in instructions and some great background about Austin. The apartment was clean and well-appointed. Fantastic space in the heart of downtown Austin. Comfortable beds, plenty of towels and a cozy living room. So much better than staying at a hotel. I was there for an event at the Austin Convention Center, which is right across the street. Host was very helpful and responsive. Definitely recommend this property. First time using Airbnb and it couldn’t have been better. Ryan was a gracious, engaging host and the condo was perfect. Location was an added plus! Ryan was extremely accommodating with this rental. He provided great check in instructions and was overall a great host. The bnb was for my boss during SXSW. 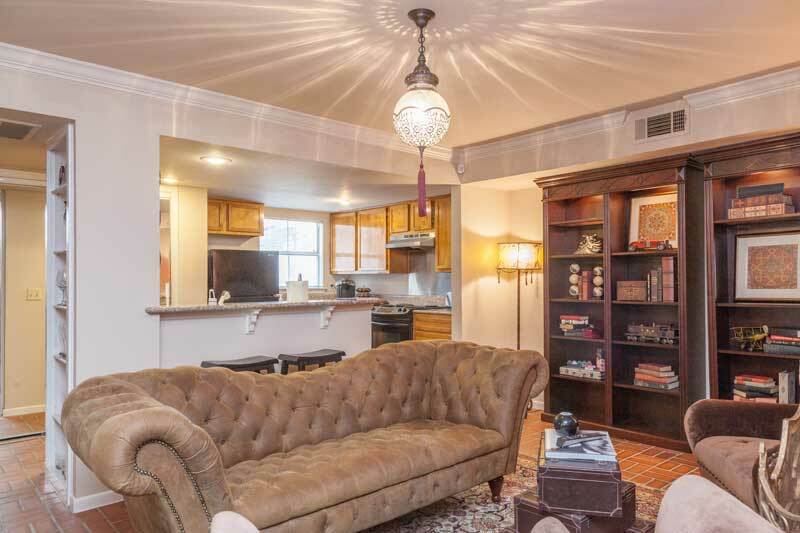 Although this rental was in a great location, my boss stated that the apartment did not appear as it did in the photos, nor was it worth the $1200/ night price tag. Wonderful place to stay! Centrally located and host is very responsive. If anyone out there is looking for a comfortable AirBnB apartment in Austin, we are happy to recommend this one. We have very limited experience with AirBnB but this one worked even better than advertised. The apartment was very nice and comfortable. We felt safe and secure at all times. The owner and management of the property are very competent. They cheerfully help us with the entire process from the very first inquiry we made regarding the rental of the apartment, to check in procedures and with all our questions during our stay. I don’t think you can ask for a better location, it is located so that you can walk to almost anywhere in the city, a line of taxis are almost alway waiting outside across the street, and public transportation is available on the other corner of the street. Flexible host and excellent location. Quiet night’s sleep. Ryan’s place was perfect for our family trip to Austin! The space itself fit our group of 4 well, but probably would have been tight with any visitors. The kitchen had the essentials needed for us to be able to make a few quick meals/snacks too. Building and surrounding area were quiet and as described. Access to the building was very easy and seamless – Ryan was very helpful and was able to quickly respond whenever we had questions throughout the stay. Above all, the location is definitely the selling point of this place – there is so much within walking distance, there really is no need for a car. Thanks Ryan for a great stay! We had a great time staying in the Speakeasy Hotel! The location was central to amazing food, cocktails, and entertainment. We easily walked everywhere. The gated community also kept us feeling extra safe. Ryan and his property manager, Thomas, laid everything out and made coming and going extremely easy. Thank you! Booking through Ryan was extremely easy and he was very helpful. The accommodation was great and exactly how he explained it. We had a great experience at the speakeasy. The location in downtown Austin can not be beat. We could walk everywhere we wanted to go. The unit was perfect. Easy to get into and clean. Couldn’t have asked for a better spot to explore Austin! Can’t wait to go back! Ryan’s condo was everything we could hope for. 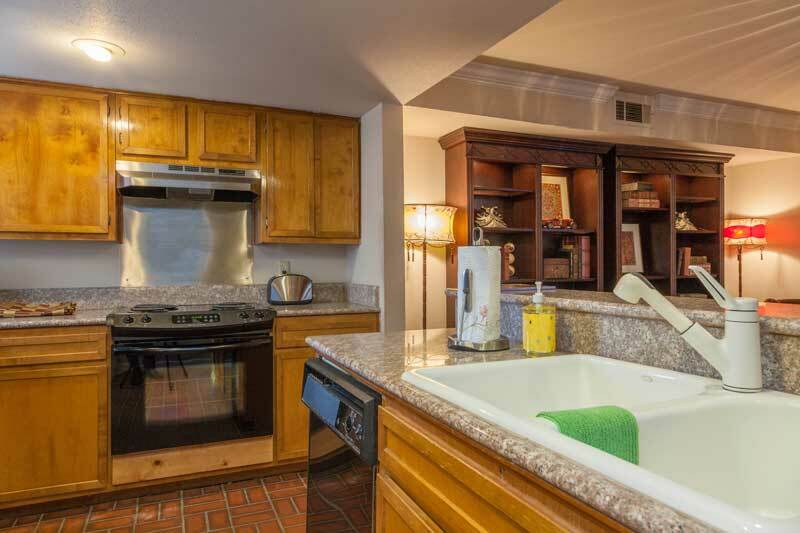 Perfect location in the heart of Downtown Austin, exceptionally clean and well stocked. We never took our car out from the time we arrived – we walked to everything! Thank you for a great experience. Ryan’s place was wonderful. It was within walking distance to so much of the town, it was a perfect home base. The place was clean and the rooms spacious. Ryan was quick to respond to and question we had. If we make it back to Austin again I hope to find this place available. The Speakeasy was great, I would recommend to friends and stay here again. The location is unbeatable. Ryan was easy to work with and very responsive. Fantastic location in downtown Austin. Blocks from Convention Center, 6th Street, and hike/bike trail around Lady Bird lake. Nice, clean, comfortable condo. Toiletries provided, along with plenty of towels. Austin’s Downtown Speakeasy was exactly how it was shown in photos and described in the listing. The condo is beautifully decorated and had everything we needed. It was extremely easy to get around since the condo was so close to all of the “action” downtown. We will definitely be checking to see if this place is available next time we have an event and want to stay downtown. This was a great place for my recent conference. So much better than a hotel, ideal for my colleague and myself and really just a 60 second walk to the doors of the conference center. If you need a great place to stay while in Austin for a conference, or anything else downtown… then stay here!! you wont be disappointed. Wonderful apartment in the heart of downtown Austin. Ryan was a great host and was very responsive to emails and questions. Everything was exactly as described and very clean. I was traveling to Austin for business and had several busy days, and it was very nice to come back at night to such a relaxing apartment. Ryan and his team did a great job setting us up with a perfect stay in Austin. The condo is exactly as stated and Ryan’s team was accommodating and quick to reply to our questions and requests. There are a lot of great places to stay in Austin but this one is hard to beat. Lovely home. Hosts were great and very helpful. 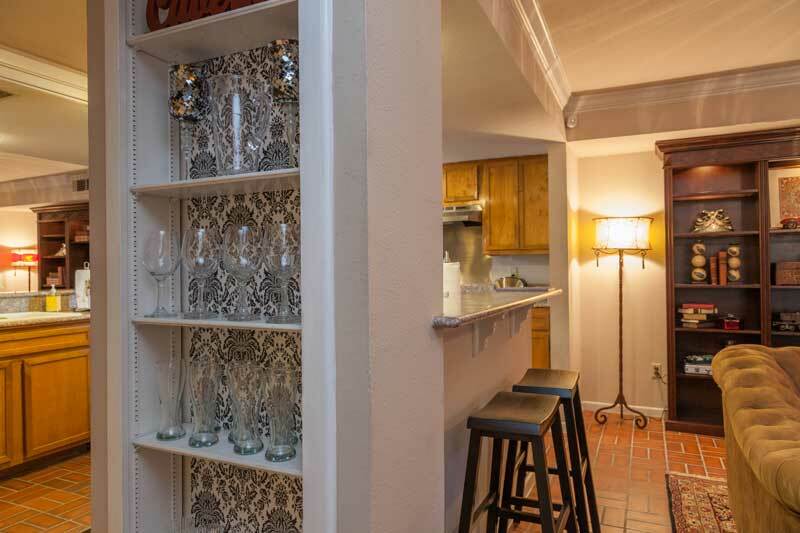 This two bedroom condo was in the Heart of Austin, a stones throw away from 6th Street and where you want to be to have good food, drink and live music. We took the shuttle bus from the airport and it dropped us off in front of the condo, easy peasy. The condo is on the second floor. Good secure building. Nicely decorated place. Had all the things we needed the most. Near a Starbucks and a Champions sports bar, and a short walk or Uber to everything else. We definitely would rent this place again! Ryan and his properties are a fantastic choice for your stay in Austin. Take it from a former resident – the location can’t be beat. Combine that with the charm of a well-decorated place with hotel-like amenities, and you’ve got yourself a perfect rental! As a first-time Airbnb renter, I was skeptical of the process, but Ryan put my mind at ease immediately. He was very responsive to communications and questions pre-booking, sent a very detailed list of instructions for everything we needed to know for our trip, and and his team immediately followed up with answers to our last-minute questions just before our stay. My only complaint is that the trip ended too soon, but I’m afraid there’s nothing Ryan could’ve done about that – else I’m sure he would’ve tried! Great experience working with Ryan. My reservation was confirmed within a couple of minutes and there is a person on-site that helps with day to day questions. 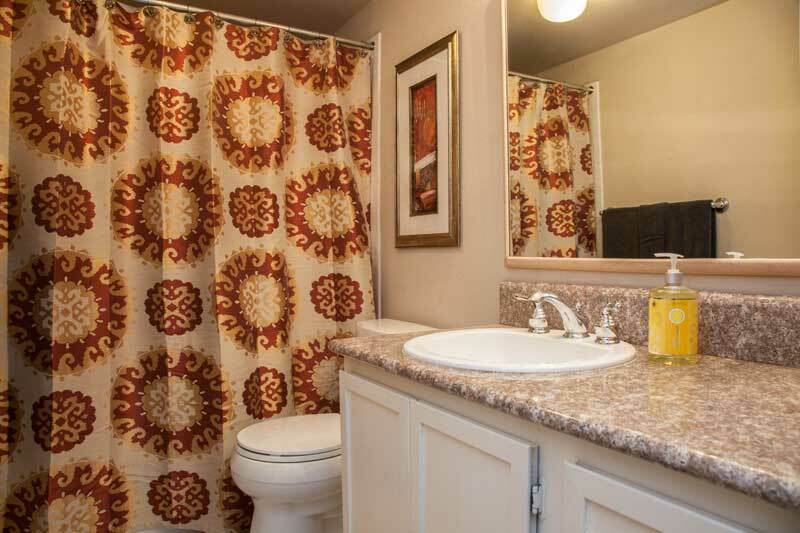 The condo was great…clean, well decorated, in a super location, with all the amenities you would ever need! Ryan provided us with lots of information on Austin and recommendations on what to do/where to eat. We felt very welcome and had a great time! Everything was perfect. Accurate description. Great Apt. Ryan and Thomas were incredibly responsive and helpful. Ryan’s apartment was the perfect location for our time at the Austin Convention Center. 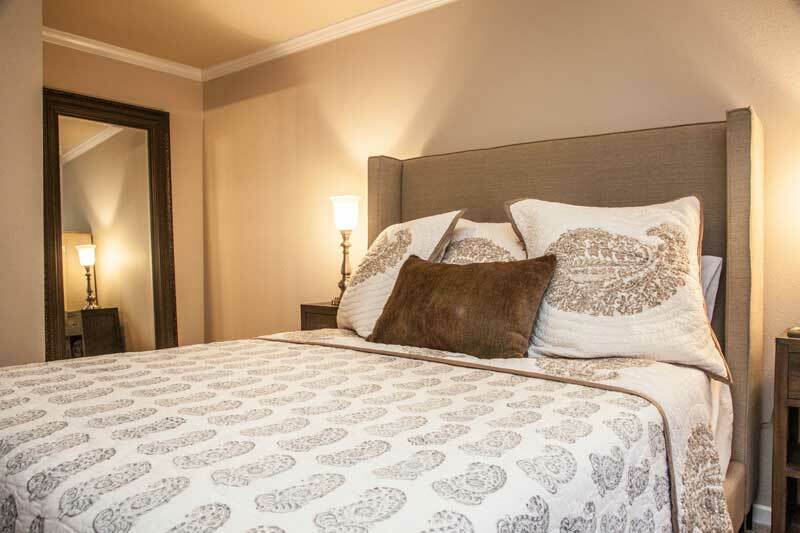 It’s exactly like the photos – clean with comfortable beds and decor. It’s also very close to the #100 airport bus and a car2go station, which made getting around Austin super easy. Ryan is a great host and was really quick to respond to questions. I’d love to visit Austin again and when I do, Ryan’s apt will be at the top of my list of places to stay. A nice, clean condo with all the amenities. Perfect location to all Austin has to offer. Ryan is a flexible and caring host. We had a great stay visiting our son and will return next year. Thanks Ryan. Ryan’s apartment was very conveniently located and a great spot for my friend and I to stay. We had an awesome time and Ryan was very easy to communicate with even while we were onsite. I would definitely recommend Ryan’s place! Ryan’s place was perfect for our family of 4. Great location. Check in was easy – Ryan was accessible if we needed anything. Would highly recommend Ryan’s apartment. Ryans place was absolutely wonderful! He was very prompt in responding to emails or text. Very clean and nice! Ryan was a wonderful host! He made our stay very easy! The apartment is Beautiful, clean, cozy, and well decorated. This condo in Austin was nearly perfect. We came with another couple to explore the city for the first time and had a blast. The welcome email we received from the host gave us detailed instructions including how to get to the condo from the airport, how to access the unit, and recommendations for food and nightlife. Our arrival was seamless and our host even accommodated an early check-in. The condo was clean and fully stocked. It was truly a home away from home as each couple had a separate room and bathroom. It was beautifully decorated, clean and welcoming. We were able to walk to everything including the Capitol. We felt like locals by the time our stay ended.